Good Monday Morning Everyone! 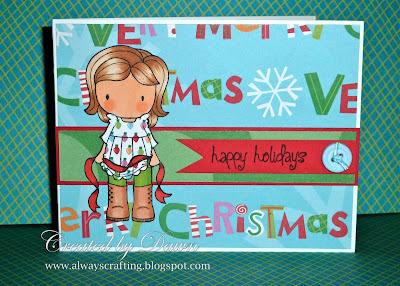 Today at Paper Playtime is the "Say it with Sentiments" Challenge! This challenge is scheduled for the 3rd Monday each Month and I was lucky enough to have been asked to be a Guest Designer for this challenge by Janis herself the owner of Paper Playtime! Thank you so much for the chance to be part of your wonderful team this month Janis! Paper - K & Company "very merry"
I wanted to create a very clean and simple card for this challenge so the sentiment really stood out. The little girls top is paper pieced and the rest of her is colored with copic markers. Just one little button with twine for an embellishment. Thank you for stopping by and please head over to Paper Playtime to join in on the "say it with sentiment" challenge. Love this Dawn! So festive and fun! Awesome creating! Thanks for linking up to the ATS Wed. Challenge! Merry Christmas! Mind if I ask? Did you cut her out and then lay her on top of the background? Sandee, yes she is cut out and placed on top of the background.